Specially trained DRS rehabilitation counselors meet the needs of West Virginia workers with significant vision impairments. Services for people with vision impairments cover a wide range of individual needs, from basic mobility training to assistive technologies. Essential Services address a broad spectrum of skills needed to work and to live independently with vision impairment. Visually Impaired Seniors In-home Outreach and Networking Services, an innovative program aimed at helping senior citizens to remain active and independent with vision impairment. Bioptic Driving, a training program that assists drivers with moderate non-progressive vision loss. If you or someone you know has a significant permanent visual impairment that keeps you from getting or keeping a job, you may be eligible for rehabilitation services. 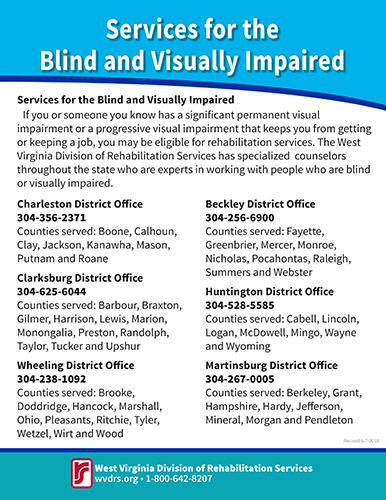 The West Virginia Division of Rehabilitation Services has counselors throughout the state who are experts in working with people who are blind or visually impaired. Meredith L. Perry serves the counties of Boone, Calhoun, Clay, Jackson, Kanawha, Mason, Putnam and Roane. Olivia A. Zivney serves the counties of Barbour, Braxton, Gilmer, Harrison, Lewis, Marion, Monongalia, Preston, Randolph, Taylor, Tucker and Upshur. Jill Konkle serves the counties of Brooke, Doddridge, Hancock, Marshall, Ohio, Pleasants, Ritchie, Tyler, Wetzel, Wirt and Wood. Jodie Gilkerson serves the counties of Fayette, Greenbrier, Mercer, Monroe, Nicholas, Pocahontas, Raleigh, Summers and Webster. Jason D. Napier serves the counties of Cabell, Lincoln, Logan, Mingo, McDowell, Wayne and Wyoming. Kathylene M. Privitera serves the counties of Berkeley, Grant, Hampshire, Hardy, Jefferson, Mineral, Morgan and Pendleton. On a single page, in large print, this document offers contact information throughout the state for our counselors for the blind and visually impaired.